Avail a travel package to London and see for yourself the capital of England standing astride the river Thames. Feed the pigeons at Trafalgar Square or walk through Hyde Park or shop on London's famous Oxford Street. London is the largest European city and is an important center of finance, theatre, music and the fine arts. The financial district of London is choc-a-block with banks and insurance companies and is a beehive of activity on weekdays. You can find the famous St. Paul's Cathedral here and the Tower of London and the Tower Bridge. There is no dearth of accommodation options in London, be it travel inns or travel lodges or bed and breakfast establishments. London is a melting pot of various nationalities and cultures. You can savor various cuisine here. Find out more on traveling to London. London is a blend of a modern metropolis and old world charm. Situated on the River Thames, London has always occupied pride of place among the greatest cities of the world. A commercial capital, London is home to numerous business houses and major world conglomerates. On the other hand, the famous monuments of Westminster Abbey and Tower of London take you back through the annals of history. The weather in London can be quite unpredictable. It can vary from dreary gray skies to crisp and foggy mornings or endless showers. Summer is the best time to visit London. Shopping in London can be a delight - from exclusive boutiques on Oxford Street to the tacky shops, flea markets and souvenir stalls that dot the streets. The two-mile stretch stretching from Tottenham Court Road to Marble Arch is a shopper's paradise - with everything from chain stores to cut price shops. Nightlife in London is abuzz with glitzy restaurants, smart hotels, lively nightclubs and stylish design bars. You can choose to spend a quiet evening at a traditional London pub or visit the vibrant pubs and nightclubs that offer jazz, rock, punk and trance music. The dancing clubs and gay bars of Soho are popular nighttime hotspots. There is no dearth of action in the West End, where you can find an abundance of dance bars, comedy clubs, restaurants and theatres. The pulsating dance floors of London offer a variety of music groups. A travel package to London will take you through the famous tourist attractions that London has to offer. London tourist maps will be of immense help in case you are planning a walking tour around the city. Maps of London can be picked up free at the Britain Visitor center at Piccadilly Circus. Westminster Abbey is an architectural masterpiece that houses tombs of kings and queens. Madame Tussauds houses lifelike wax models of famous personalities, be it the British Royal family or American presidents or rock stars. Take a keepsake snap with the who's who of the world of sports, glamour and cinema. No travel package to London is complete without a ride on the London Eye - the observational wheel that gives you a spectacular view of central London and beyond. Tourists from all around the world enjoy the sight of Oval Cricket Ground, Westminster Abbey, Houses of Parliament and Big Ben, Buckingham Palace, British Museum and much more on this half hour ride in glass capsules. A visit to St. Paul's Cathedral is part of every tour of London. This cathedral boasts of excellent acoustics and has been witness the jubilee celebrations for Queen Victoria and King George V and the wedding of Prince Charles to Lady Diana. The most recent celebration was the Thanksgiving for the Golden Jubilee of the Queen. The Tower of London that dates back to the times of William the Conqueror is now a UNESCO World Heritage site. Don't miss the Change of Guards ceremony at the Buckingham Palace. Enjoy a stroll through Kew Gardens or Hyde Park. The Westminster area of the city of London houses the Big Ben and Westminster Abbey and the famous Downing Street. The expensive addresses of London are Kensington, Chelsea and Knightsbridge. The Docklands or the working districts house the Canary Wharf Tower, the tallest building in Britain. London in England has been the hub of a social and cultural amalgamation since the twentieth century. Central London has the shopping streets of Oxford and Regent Street and neighborhoods such as Soho, Covent Garden and Bloomsbury. The London Underground is the quickest yet expensive way to travel within the city. It might be worthwhile to avail of a TravelCard if you are planning on traveling extensively on the Underground. Arm yourself with a London Tube map to aid you in your exploration of this wonderful city. The Docklands Light Railways offers automated trains around the Docklands and Greenwich area. 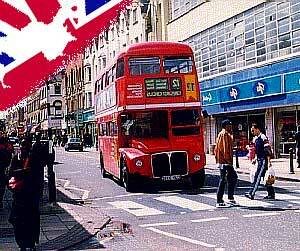 Yet another option to travel in London is the famous red double Decker bus. Sit atop these buses and you can get a wonderful ride through the city. The black cabs of London can be flagged off the street but can be an expensive means of transport within the city. Alternatively, you can utilize the services of car hire agencies in London - either for a sports car or utility vehicle for your transportation needs. You can book your car online and avail discounts too. London Heathrow airport is the busiest airport in the world. With nearly 90 airlines having their base here, it is little wonder that the Heathrow airport is an important hub in the aviation network. Heathrow airport in London has four terminals handling nearly 63 million passengers annually. The airports at Gatwick, Croydon, Luten and Stansted have also contributed to the growth and development of London's economy. Check accommodation in London in advance to save yourself any hassles. The holiday season sees hordes of tourists descending into London and it could be quite inconvenient to be stranded sans appropriate London hotel booking. You can check up the websites of hotels that would give you an idea about their rates and services. You can also use the services of hotel consolidators for booking accommodation in a travel inn in London. Look up online guides and directories that will provide you with a database of hundreds of bed and breakfast places or travel lodges in different localities of London. You can bask in the comfort of a luxury hotel in London. Savor the excellent service and facilities offered, all at a price though. No other city in the world other than London and perhaps New York can boast of such a wide and diverse range of cuisine. You can take a quick bite on the move or spend a romantic evening at a fancy restaurant. London restaurants are a gastronomical delight. Takeaways and delis are popular for those who want a quick bite. The traditional English restaurants still serve typical British cuisine, a popular dish being London broil. Indian curry is popular and there is no dearth of Indian restaurants in London.